THE RED SOX OFFENSE WOKE UP!! THEY ACTUALLY SCORED SOME RUNS FOR PORCELLO!!! The Red Sox erupted for eleven runs on sixteen hits - including three home runs - to defeat the Twins 11-1 at Target Field on Saturday afternoon. Boston scored as many runs in the top of the second inning - eight - as they had in Rick Porcello's last four starts combined. 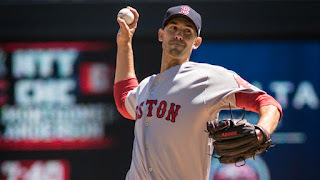 For his part, Porcello (pictured) went seven innings allowing one run on seven hits. He struck out six and didn't walk a batter. For Porcello, it was his first win since Opening Day. Xander Bogaerts, Andrew Benintendi and Sandy Leon each had three hits. Mitch Moreland and Chris Young each had a pair including two solo home runs for Young.